Every fourth man and every fifth woman is affected by apoplexy. In 85 percent of all cases the disease is caused by a thrombus. Thrombolysis opens 60 percent of all closures. But diabetics have a more adverse prognosis. In Germany,every second minute sustains an apoplexy. Not only is apoplexy the third mostcommon cause of death in the Western countries, it is the commonest diseasecausing permanent invalidity. 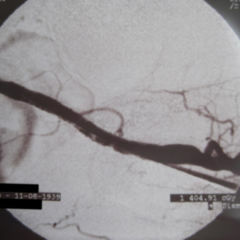 The closure of a brain artery critically impairsblood circulation in the brain within a very short time thus leading toirreversible ruin of nerve tissue. In apoplexy management, intravenous thrombolysis has become first choice oftreatment if first symptoms are not dating back more than 3 hours. It isperformed as an intravenous treatment with a recombinant tissue-thromboplastinactivator (rTPA). A dose of 0.9 milligrams per kilogram bodyweight isrecommended with a maximum quantity of 90 milligrams. 10 percent are given as abolus, the rest as a one hour infusion. The faster the patient is undergoing athrombolysis therapy – the better. New data ofthe Innsbruck neurologists and radiologists shows which the key factors are fora successful therapy. In more than 60 percent of the cases, the closed brainvessel can be reopened. The neurovascular working group at the Universitätsklinik für Neurologie has – together with the Klinischen Abteilung für Radiologie II – published a study in theprofessional journal "Neurology ". During this study they examined100 apoplexy patients lysed with rTPA. It was checked whether the vesselclosure could be eliminated and which clinical results could be observed threemonths after recanalization. 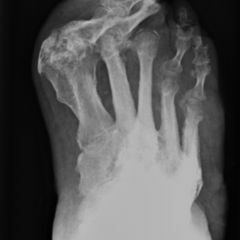 The therapy was evaluated via different imagingtechniques both, 24 hours prior and 24 hours after. This line of examinationswas the largest of its kind of non-selected lysis patients. 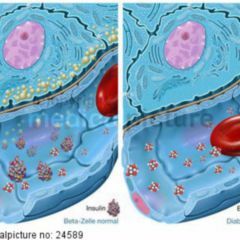 In the dataevaluation of the various patient groups, one highly significant result came tolight: While the average recanalization rate, completely or partly reopening ofthe vessel totalled up, was high with 66 percent, in only 9 percent of thecases of diabetes mellitus patients the reopening of a vessel closure wassuccessful. Diabetics have more adverse results. Those results obviouslyreflect their disturbed coagulation system where a multitude of coagulatoryfactors are regulated up. "We surmise high levels of Plasminogen-Activator-Inhibitor 1 (PAI-1) are playing a role sincethis molecule abolishes the effect of rTPA directly", explains neurologist Dr.Martin Furtner. "In early lysis studies on infarct patients we detected highPAI-1 levels in diabetics as causative for a bad response." 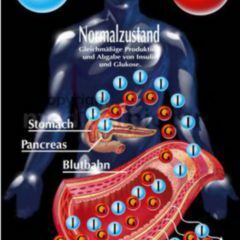 Since 20 to 30percent of all apoplexy patients suffer from diabetes mellitus, hopes lean onthe development of novel, plasminogen-independent lysis drugs. Internationalstudies are concentrating with full speed on the implementation of such substances. TheInnsbruck researchers were also able to prove that recanalization is thestrongest predictor for positive results after 90 days. Patients, whose brainvessels were made patent again, lived their lives mostly autonomously. Patientswith lighter strokes as well as younger patients and those coming at an earlystage to get therapy, benefit regarding long-term results. Longer vesselclosures starting already at a level with the carotidartery respond to the thromolysis therapy considerably worse andthus show much less positive long-term results.